Nick Gilder was born on December 21, 1951 in London, England. He began his career in music as the frontman of the glam rock band Sweeney Todd. In 1977, Gilder went solo. His first album, 'You know who you are' (1977) flopped, but the second album 'City nights' (1978) spawned the Canadian number one hit 'Hot child in the city'. 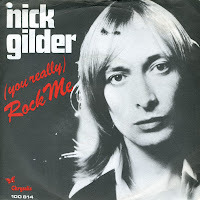 '(You really) Rock me' was taken from Gilder's third album 'Frequency' and reached number 35 in the Canadian singles chart, and number 57 in the US Billboard Hot 100. In the Netherlands, the single did not chart, but I still vaguely remembered it. Glad I found it.